We’re pleased to announce that Visual Facilitator and Artist Emily Wilkinson from Mindful Maps will be joining us at the 6heads Innovation & Sustainability Forum to do some Graphic Harvesting of the conversation, and create a visual record of the process. Graphic Harvesting (otherwise known as graphic facilitation or graphic recording) is the art of drawing live to capture key information in images and words, and create a visual group memory of the process. It is very popular at events, conferences, meetings and workshops. You’ll see the visualisation taking shape somewhere in the room on a very large sheet of paper. Through Mindful Maps, Emily offers Graphic Harvesting, Visual Facilitation and Social Art to groups and individuals. Using a variety of tools she draws out empathy with information and helps people learn creatively in order to visualise process and positive change. By documenting processes and journeys through creating physical artifacts, Mindful Maps helps navigate and design pathways to more creative and sustainable realities. This conversation is incredibly complex and multi-faceted, and the 6heads have my admiration for convening it! My own background is in sustainability and design, particularly communications and image-making. 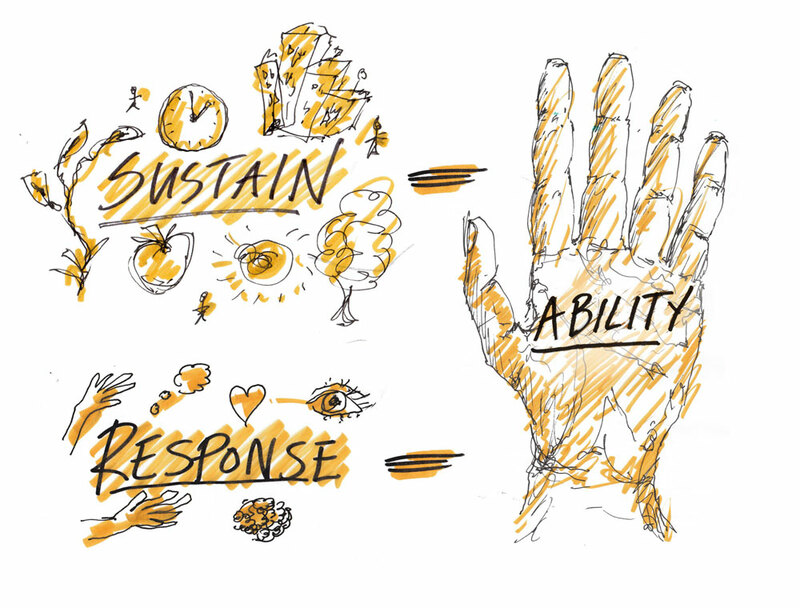 When I did my Masters Research (MA Design Futures at Goldsmiths), I found myself questioning the language of sustainability, and whether it is always the appropriate word the use. When talking about our ability to sustain, what we may actually want is to change or innovate. The word responsibility also featured in this exploration; how do we take this term away from implications of duty and guilt, back towards it’s original meaning which is our ability to respond? I suggest that rather than focus on sustainability, we focus on sustaining our ability to respond in a holistic way; to our environments, to other people/beings and ourselves. This angle on sustainability was partially influenced by my interest in health and well-being, and how we can integrate creative practice with everyday life for a more sustainable way of being in the world. ‘Business as usual’ will not help us move forward in terms of the planet, society or our own lives, and this aspect of the event very much resonates with my practice. I am also influenced by the practice and theory of mindfulness, in general and when thinking specifically about sustainability. A mindful approach to practice means to be consciously aware of how our intentions and actions affect the world, how we can better accept reality, and how we might expand our capacity for change. Please come and say hello on the night, you can read more about Mindful Maps at www.mindfulmaps.com and follow me on Twitter @mindfulmaps.